Love, Mrs. Mommy: Back To School with Mead Five Star Giveaway! Back To School with Mead Five Star Giveaway! This giveaway is perfect for all the kiddies going back to school in the fall. It feels like summer just started, but school will be here before you know it! 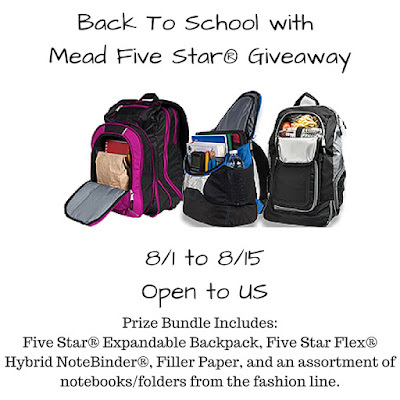 Check them out on Facebook & Twitter~1 Winner~~Prize~ Mead Five Star®Prize Bundle includesFive Star® Expandable Backpack, Five Star Flex® Hybrid NoteBinder®, Filler Paper, and an assortment of notebooks/folders from the fashion line. Thanks to all of the bloggers promoting this giveaway. All of our giveaways are so much fun when we do it all together.